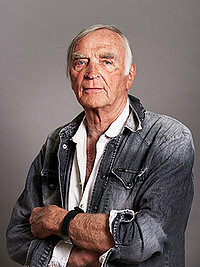 World Artists and their Story, 33 – Auke de Vries | Marbella Marbella – Adelante! 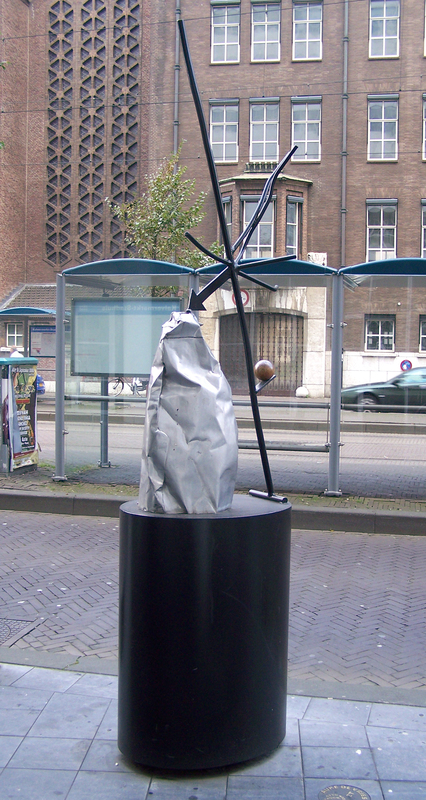 In The Hague there are some ten sculptures of Auke de Vries in public space. In front of the Ministry of Foreign Affairs there is the light green ‘shot-down helicopter’, behind the Station Hollands Spoor, is the swaying serpentine hose and in the inner city, as part of The Hague’s sculptures gallery, there is the ‘De Vries’ Pedestal’. Recently I was at a lecture by Auke de Vries about his work at The New Institute in Rotterdam, formerly the Dutch Architecture Institute, where Adri Duijvestein once was director. 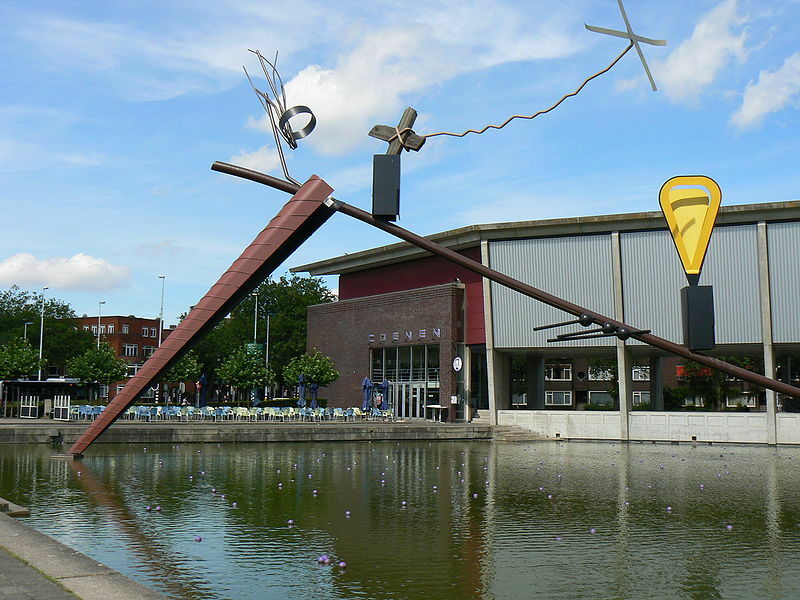 In front of that institute there is also a work of De Vries, in the pond, a long line with different elements, in and above the water. He works on a table in the attic in the Hague Sea Heroes (Zeehelden) neighborhood. 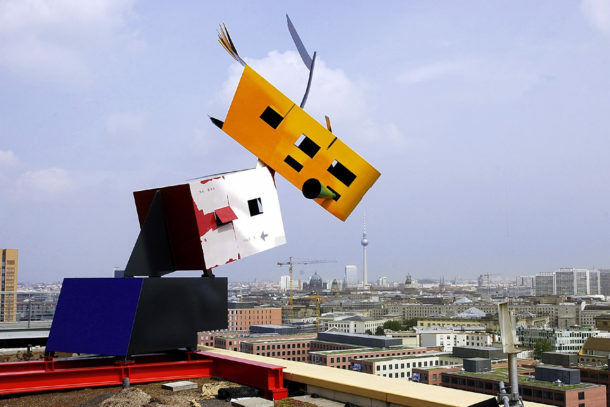 “I make a minimized big sculpture.” When the sculpture is magnified, he will search for the right proportions again. He makes those larger statues, about twice the human size, in an atelier in Kijkduin. If it becomes a sculpture for public space, it will – usually – be even bigger. The implementation is carried out by specialized companies, under the direction of De Vries. He also closely monitors the on-site installation. Meanwhile, he has become world famous. 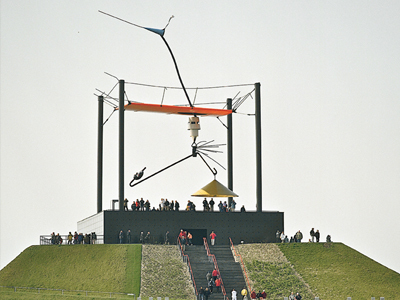 A few years ago he already had over 1000 sculptures in his oeuvre and the number is still growing. 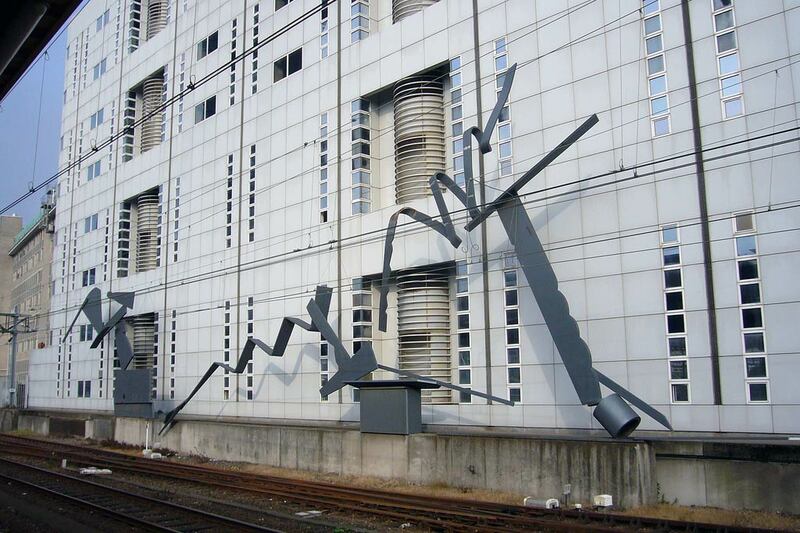 Besides in the Netherlands there is work of De Vries in Germany, England, France, Spain, South Africa and Thailand. One of his most famous sculptures is in Rotterdam, the Maas sculpture of 1982. 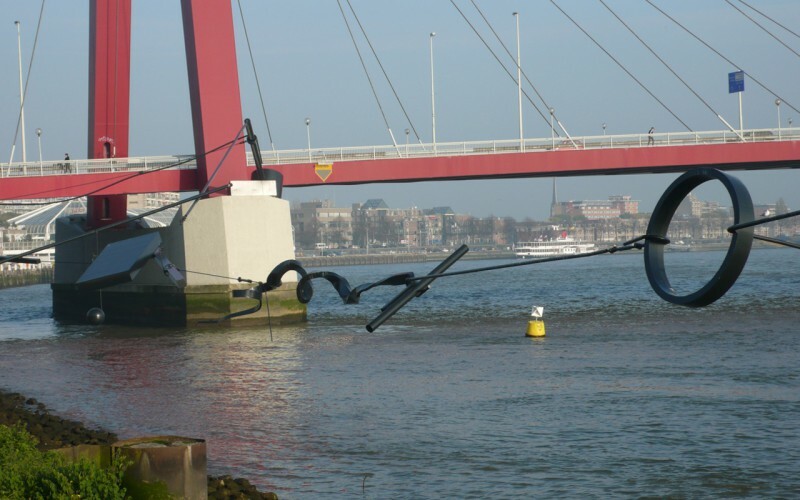 The 200 meter long sculpture floats above the northern bank of the Maas / Meuse and consists of abstract shapes connected by a linear curl. 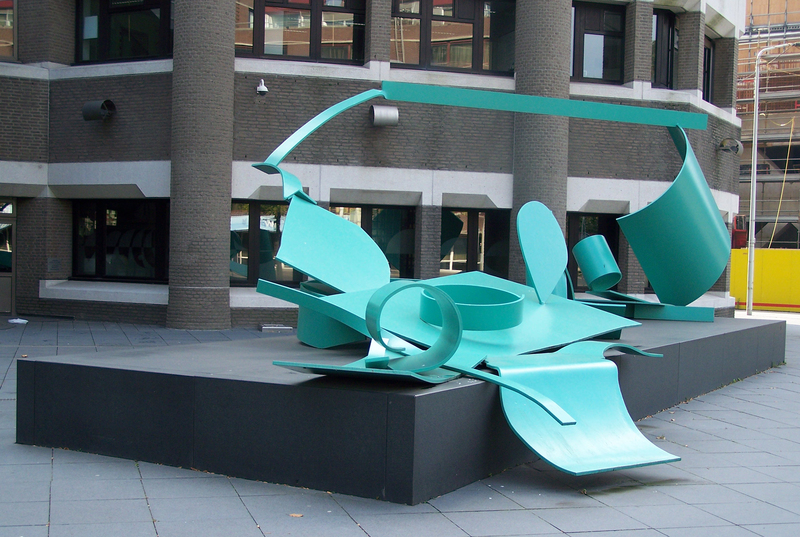 The mutual parts of the sculpture move relative to each other under the influence of wind and tides. Above the roof of the Daimler building on the Potsdamer Platz in Berlin is the work Landed (2002). “The roof is by Renzo Piano. 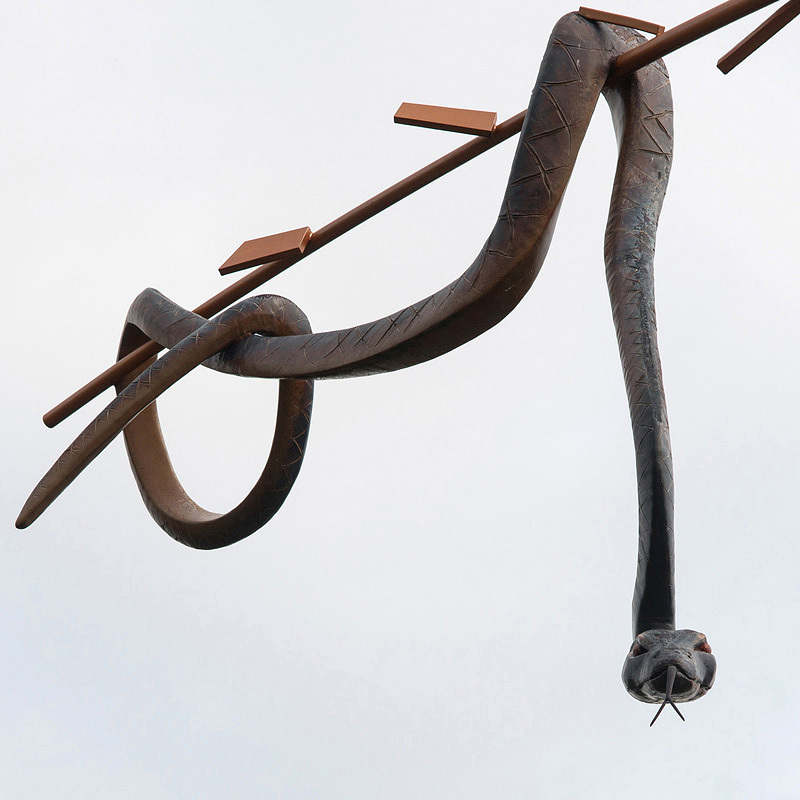 My sculpture is balanced, it fits the environment, it’s no longer my sculpture but that of the city.” In the German town of Ludwigsburg he made a 21 meter sculpture with a snake in it. For the Floriade of 2002 he made in the Haarlemmermeer The Temple. 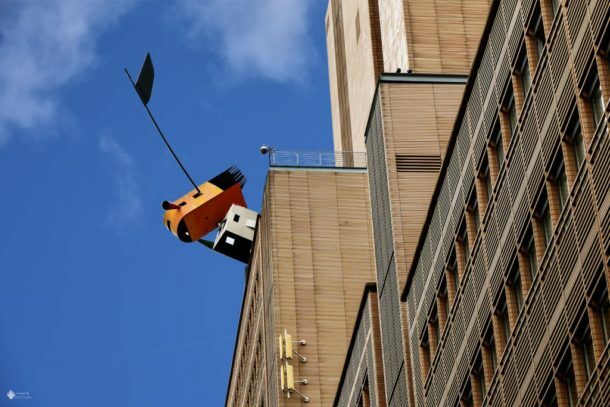 In a space temple on a 30-meter pyramid he placed a free-hanging object with a large copper platter that could be moved by the wind. On the inside of the platter was a painting of the universe. In this way he wanted to let the visitors experience the space. In the pedestal of the work there was a room in which one could hear the noise of bats. 15,000 visitors per day underwent the experience. Over the past few months, Museum Beelden aan Zee in Scheveningen showed a beautiful overview of the ability of this almost 80-year-old, particularly fit-looking artist.